We have taco night 2 or 3 times a month. I’ll eat 4 tacos and then look down at my plate. It’s like there’s a bonus 5th taco there. My wife brings a fork to eat the scraps, I don’t see the point… I ate the first 4 with my hands… why stop there? What is the messiest meal you eat on a regular basis? A taco-repelling shirt. That’s actually a good idea. I need one of those in white, with a tomato sauce-repelling coating. Finger food is fun. For the extra toppings on the plate after tacos, I use a fork too. I’m a clean eater, so I usually stay away from food that make a mess. Ice cream, spaghetti and Coke. Not all at the same time, but separately, they all seem to find their way onto my shirt somehow. i had this burrito type thing for dinner yesterday that fell apart as i ate it. i finished the tortilla several bites before i finished the stuff that started out inside it. it was pretty messy. Nachos are definently my messiest meal.. I tend to get myself and the floor a mess because I don’t eat nachos with a fork generally. I’m mostly a clean-ish eater, but I generally spill coffee on me. No matter what I do, I will spill a bit of my first coffee everyday. A gyro. I love the way they pile on way more meat than you could ever really hope to contain in a pita. Then they add the Tzatziki sauce (fun to say AND delicious) all over and it just snowballs from there. I remember eating at a local gyro joint with a buddy one day and there was a kid there, maybe 8 or 9, that was literally covered in the sauce up to his elbows. It was inspiring. Let’s just hope Biff doesn’t drop the whole thing on his shirt, otherwise that’ll be a huge mess to clean up. Heh… My messiest food is taco’s too. They’re always so hard to keep together! It’s important to check the repulsion coefficient of your shirt before purchase. 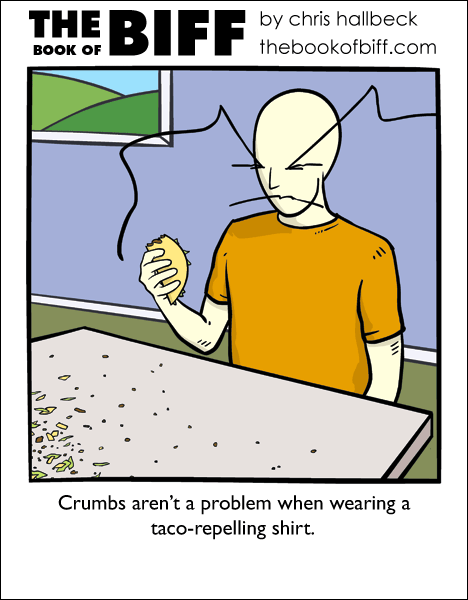 Sufficiently strong garments will also eliminate crumb problems–by rendering it impossible to even approach a taco. This one time, I wore a shirt so powerful, Taco Bell gave me a restraining order. I don’t know why but I can never seem to keep hamburgers together, and the way I like them I get ketchup and mustard everywhere and I somehow lose the tomato. But tacos and burritos I can eat without spilling anything. Rice is my messiest food, probably because I insist on using chopsticks to eat it (I’m a traditionalist with no room for common sense). I’d prefer to have one that repels bullets, knives, and blunt objects though… It would augment my present super powers nicely. As of right now, I can stop speeding bullets with my body, but I can only do it once. It’s also messy and hurts like hell. The messiest on a regular basis, eh? Probably sausage with cheese tortellini in your garden variety marinara. Coat that with freshly grated parmesan, some romano, and it’s as smelly as it is messy. For the longest time, every hot dog I ate would find a way to deposit its mustard on my person. It got so bad that I had to scorn the mystery meat for a few years to break the trend. I’m ok, now. I think. My wife and I were invited over to a friends house for a traditional African dish, mainly involving rice and chicken. The hosts passed around a bowl for us to wash our hands in and then we were instructed to simply eat from the main dish in the center of the table, with our hands. No utensils were allowed. Oh yes get me one of those!! I agree that tacos are pretty messy and I usually eat the leftovers with a fork, too. But Taco Bell’s food seem to be messier than my homemade ones. to keep the mess at a minimum. I’m otherwise a neat eater. Subway sandwhiches.. they’ve changed their bread and now the damn things fall apart as you eat them. Hence, I wind up with the insides mostly outside of my insides. *sigh* I don’t eat much else that’s really messy. i once ate a hotdog, and found ketchup on the back of my shirt. how in the heck does that happen?! I can’t eat anything with crumbs, for example potato chips. My little brother is worse, though. He apparently just has really bad aim. So by the end of the meal, he’s eaten half his food, got a fourth on his face, and the rest on his shirt. He has no more white shirts, they’re all stained into submission. The worst thing about it? He’s nine years old. this isn’t about food, but it’s a mess anyway. one year me n my friend were really into fancy inks and pens and stuff like that, and we bought a little tub of ink for our groovy feather quills. well, we were writing and managed to get the stuff all over our hands. once we cleaned up and put everything away, i went home and took off my shoes and got all sorts of cosy. and then i glanced down at my foot to find i got the ink on my sock. Taco bell tacos are TERRIBLE. Seriously. I used to eat them once a week with my dad, but we stopped going after awhile. Then I started eating tacos from Por Que No? (a local taco place) and I never went back! It was only when taco bell was the only option that I fully realized how horrid they were. Messiest food, definitely fajitas. I use a soft tortilla outside my crunchy taco to fix the collapsing shell problem. Not only does Biff invent something that doesn’t kill him, it’s actualy useful! Way to go Biff- or maybe I should be thanking Chris…. whatever. As for the messiest foods, I’d say…. cake! Yes, eat cake everyday! samosas are pretty messy….and as a kid, there was pasta! After you’re done with the four tacos, you need to grab some of the left overs, like meat, salads and sauces and mix it all on the plate with the crumbs and bits that have fallen off. It’s the best, nay the only, way for people to finish eating tacos. On topic, tacos are definitely the messiest. I eat about 6 each time and end up with 2 bonus tacos at the end. Homemade sushi. I’ve tried making it myself a couple of times, and the process of creation always winds up with me absolutely coated in rice up to the elbows. Eating it can be pretty messy, too, since it’s really hard to get the rice mixture correct and have the rolls stay together. Speghetti personally… I used to manage to get it EVERYWHERE…. just wait until he swallows it. his shirt’ll either get a bit bigger, or just explode. knowing biff itll do both. Eggrolls always seem to do the same thing as tacos. I buy a massive box from Sam’s Club and we have them when we’re too busy to cook. Oh yes, they are tasty and messy. My first thought was the curry I usually have on a Thursday- but thinking about it it’s pasta in tomato sauce that always finds it’s way onto my clothes. Though that could just be as it’s more noticable than the light yellow curry sauce. Hot dogs! I never fail to get chili all over my hands, shirt, pants and the floor. Then it seems like the chili seeps int my skin and my fingers smell like chili all day. It’s very annoying… Which is why I usally don’t eat hot dogs. Ps. Love your comics Chris! Biff rocks! Spagetti, sandwiches, any food really is messy for me. Then again, I only have one hand to eat it with… and everything not in my mouth happens to end up up my shirt, which ALWAYS happens (just happens) to be white. I’d say spicy cheeseburger soup. Yes that’s a real recipe. It’s not super cheeseburgery or anything like eating a liquid cheeseburger, but it is really good. Its got some jalapeno, potato, and carrot in it. Not sure what else or the measurements. I could ask for the recipe from my mom if someone wants it. The mess is more when you reheat it though. Soup likes to explode a bit in my microwave, especially the thicker ones. That and it likes to cake onto the bowl. As for mess on my hands (and/or plate for hand held meals) I’d say home made burritos and ribs. It would make it hard to eat if you had a short neck. Gotta be thursday night menu. Living by myself in an apartment too nice for my budget leaves a paltry amount of cash left over to split between my nicotine and food budget. The result? I wind up with an odd assortment off partial food stuffs that I typically just throw in the wok and stir fry. Rarely disgusting, invariably messy. I’m Indian. We eat curry and rice with our hands 😀 Skillfully. Burgers and hotdogs. I practicaly drown them in ketchup and mustard. I eat hollands steak and kidney pies, but i eat them a SPECIFIC way. I cut the top off, and leave it for later. Then, I scoop the inside onto a sandwich and eat it. It tends to drip out onto my shirt. Then i just eat the pastry. I am not a clean eater… I have many a shirt that has ended up with squirted sauce or spilled drink on it. i usually eat so neatly that my white shirts have no spots on them…even if i’m eating sloppy joes. Then again, i usually don’t leave the house, so i don’t WEAR a shirt. Hence why most of them are so clean. @Karen You think that’s bad? try eating it with chopsticks afterwards…though i’m pretty good at using them…still, it’s hard as heck to keep the sushi in the grip of the chopsticks. rice is a bit easier, though.